Computer - Means of training a new vision of education, research and innovation. Scientific research, technological development and innovation, together with the educational system and Information and Communication Technologies (ICTs), is the basis of knowledge-based development society. The book is a monograph that addresses the first time a rigorous systematization of technologies offered by computers in education, research and innovation. The present book systematically deals with the role of languages and technologies in the process of gaining knowledge and offers justification in the spirit of the recent developments and trends. It starts from the idea that the computer offers powerful tools for learning, knowledge and development. 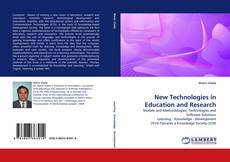 With examples and case studies, the book presents clearly demonstrable implementations and experiences on e-learning technologies. The author has a proven expertise in subject matter and promotes interdisciplinarity in research. Rigor, argument and demonstration of the presented material in this book is a milestone in the scientific domain. "Human development is accomplished by Knowledge and Learning." (Vlada and Ţugui). "Learning is power" MV.